More recently, a ‘design’ has emerged in eHam forums that appears to be identical. 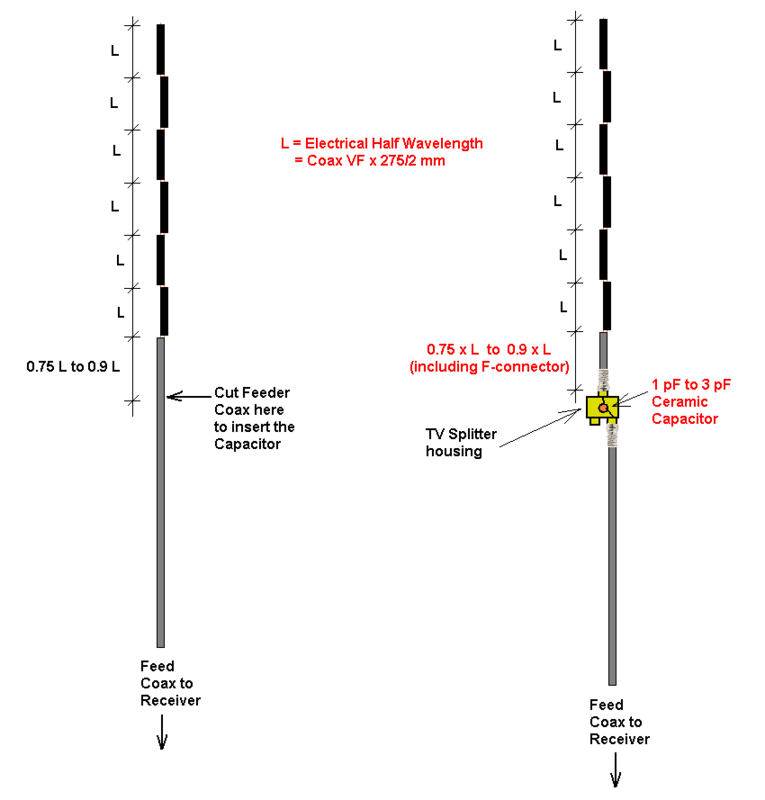 These antennas are intended to be some number of close spaced co-phased half waves with a system of coax sections with transpositions at each feed point to provide the co-phase drive. Given that the elements are fed at near to voltage maxima and they are effectively feed in shunt, it takes many such elements to obtain an impedance anywhere near 50Ω, so short arrays will require some form of impedance transformation if a 50Ω or similar feed point is needed. There is a fundamental problem that the coaxial interior sections and exterior radiating surface cannot both be an electrical half wave unless the velocity factor of the coax is close to unity. The usual compromise is that high vf coax is used and the coax section is cut for an interior length of a half wave, and the less than half wave exterior is suffered with some degradation. The length of the coax section should then be 299792458*vf/f/2 (f in Hz). The top section is often wrong. Variously it is effectively around a quarter wave in length or the same length as the coax sections (~65-85% of a free space half wave) when what is needed is about 95% of a free space half wave depending on the diameter of the conductor. 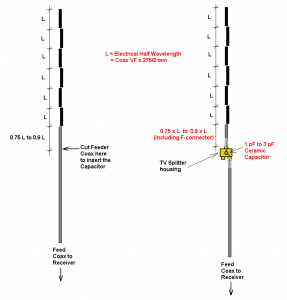 The bottom section (ie below the bottom feed point) should also be about 95% of a free space half wave depending on the diameter of the conductor, to some form of device to decouple the feed line (quarter wave radials or some form of effective common mode choke). This is omitted from most published designs. So with that in mind, lets review the latest eHam forum design. Above, an extract from the thread… and some more detail on lengths. The design uses coax with vf=0.83, an acceptable compromise and the sections should be an electrical half wave at 1090MHz which is 114.1mm, ok so far. Note that the top element is the same as the next element, failure #2 listed above. It should be longer. The bottom section is not delineated by some form of effective common mode current decoupling, failure #3 above. The design includes a form of impedance matching, but it is matching a flawed antenna. Fixing the issues mentioned will change the input impedance and that will probably require a changed impedance match. The impedance match was not shown conclusively to transform the load to 75Ω, but if it did, it suggests that the load offered by the dodgy collinear is around 260+j0 (VSWR(75)=3.5) at the lower coax transposition (not surprising). 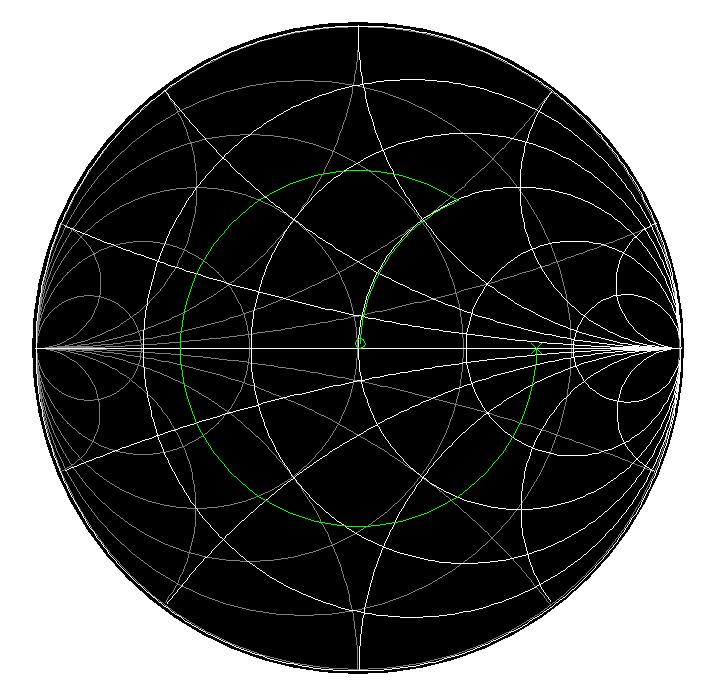 The Smith chart above (normalised to 75Ω) shows the transformation with 152° of 75Ω line and a series 1.5pF cap.